Ānāpānasati (Mindfulness of Breathing) by Buddhadāsa Bhikkhu. Series of lectures to monks delivered at Suan Mokkh in 1959. Translated from the Thai (อานาปานสติภาวนา) by Bhikkhu Nāgasena. First edition. Vol. I, II, III. Sublime Life Mission, Bangkok, 2523/1980. 318 p.
The A, B, C of Buddhism & The Meditative Development of Mindfulness of Breathing by Buddhadāsa Bhikkhu. "The A, B, C of Buddhism" lecture was given in English [and video-recorded] on 14th October 2525/1982 at Suan Moke Forest Monastery, Chaiya. [AUDIO]. "The Meditative Development of Mindfulness of Breathing (Ānāpānasatibhāvāna)" lecture was given on 13th August 2515/1972. Edited and translated by Stephen Schmidt. Sublime Life Mission, Bangkok, 1982. 71 p.
Handbook for Mankind: Principles of Buddhism explained by Buddhadāsa Bhikkhu. Translated from the Thai (คู่มือมนุษย์) by Ariyananda Bhikkhu (Roderick Bucknell), edited by Nāgasena Bhikkhu. Sublime Life Mission, Bangkok, 2527 . 122 p.
Heart-Wood from the Bo Tree by Buddhadāsa Bhikkhu. Three talks ("The Essential Points of the Buddhist Teachings," "Emptiness," and "The Way to Practice in order to Abide with Emptiness") given to a Dhamma study group at Siriraj Hospital, Bangkok, on 17th December 1961 , 7th and 21st January 1962. Translated from the Thai (แก่นพุทธศาสน์) by Dhammavicayo. Suan Usom Foundation, Bangkok, 2528 . 99 p.
Translated from the Thai (คู่มือมนุษย์) by Ariyananda Bhikkhu (Roderick Bucknell), edited by Nāgasena Bhikkhu. Sublime Life Mission, Bangkok, 2523 . 121 p.
A Shortcut Through Vipassanā Meditation by Buddhadāsa Bhikkhu. Four talks from the 'Samatha-Vipassanā Meditation of the Nuclear Age' Maghāpujā series given in 1984: "A Shortcut through Vipassanā Meditation" (3rd talk), "Meditation On Walking Movement" (4th talk), "Meditation On Standing Posture" (5th talk), "Meditation in Lying Postures And Others" (6th talk). Translated from the Thai by Kingkeo Attagara. Suan Usom Foundation, Bangkok, 2528 . 88 p.
The A, B, C of Buddhism & The Meditative Development of Mindfulness of Breathing & The Discourse on Mindfulness of Breathing by Buddhadāsa Bhikkhu. "The A, B, C of Buddhism" lecture was given in English [and video-recorded] on 14th October 1982. [AUDIO]. "The Meditative Development of Mindfulness of Breathing (Ānāpānasati-Bhāvāna)" lecture was given on 13th August 1972. "The Discourse on Mindfulness of Breathing: Ānāpānasati Sutta" had first been translated from Pāli into Thai by Buddhadāsa Bhikkhu. Edited and translated by Stephen Schmidt. Revised edition. Sublime Life Mission, Bangkok, 2529 . 74 p.
Four essays of 1974-1976 : "Democratic Socialism" [ARCHIVE], "A Dictatorial Dhammic Socialism," "A Socialism Capable of Benefitting the World," and "The Value of Morality." Buddha-Dhamma for Students: Answers to the questions a non-Buddhist is likely to ask about the Fundamentals of Buddhism by Buddhadāsa Bhikkhu. Translated from the Thai (ธรรมะกับนักศึกษา) by Ariyananda Bhikkhu [Roderick Bucknell]. Sublime Life Mission, Bangkok, 2526 . 72 p.
Paticcasamuppada Dependent Origination by Buddhadasa Bhikkhu. Translated from the Thai by Stephen Schmidt. Sublime Life, Bangkok, 2529/1986. 90 p.
Translated from the Thai (ธรรมะ ๒๔ เหลี่ยม) by Suny Ram-Indra. Suan Usom Foundation, Bangkok, 1986. 28 p.
Translated by Santikaro Bhikkhu. Dhammadana Foundation, Chaiya, 1986. "Buddhadasa Bhikkhu on Pridi Banomyong." Talk given at Suan Mokkh for the funeral of Elder Statesman Pridi Banomyong, on 11th May 1986. "The Dawning of Truths Difficult For Anyone To Believe" by Buddhadāsa Bhikkhu. Sixth 'Dawning' from The Eighty Years of Age Remembrance Book by Buddhadāsa Bhikkhu. Translated from the Thai by Santikaro Bhikkhu. In: Evolution/Liberation #2, Visaka Puja Season 1987, pp. 20-21, 52-54. Chaiya, 1987. "Happiness and Hunger" by Ācariya Buddhadāsa. "A Notion of Buddhist Ecology" by Buddhadasa Bhikkhu. From "The Degeneration of the Sila-dhamma (Morality) in the External World," a chapter of Sila-dhamma and the Human World, Thammathanmunithi, Bangkok, 2520/1977. Heart-Wood from the Bo Tree (Making Mutual Understanding Between Religions: Series 3) by Buddhadāsa Bhikkhu. Translated from the Thai (แก่นพุทธศาสน์) by Dhammavicayo. Distributed by the Buddhadāsa Foundation, Nonthaburi. Suan Usom Foundation, Bangkok, 2530 . 99 p.
"Till the World is with Peace" by Buddhadasa Bhikkhu. 13th lecture of the Asalha Puja Series, n.d.
"The A, B, C of Buddhism" by Buddhadasa Bhikhu. 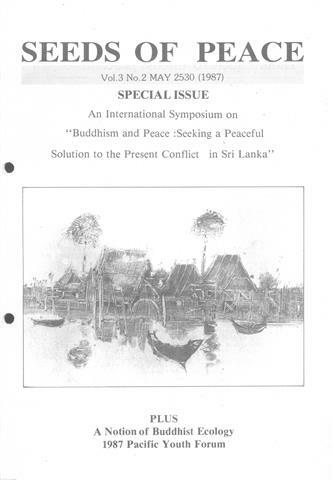 A lecture given in English and video-recorded on 14th October 2525/1982 at Suan Mokkh. In One Vehicle Volume 2., pp. 18-26. National University of Singapore Buddhist Society, Singapore, 1988. Buddha-Dhamma for Students: Answers to questions a non-Buddhist is likely to ask about the fundamentals of Buddhism by Buddhadāsa Bhikkhu. Translated from the Thai (ธรรมะกับนักศึกษา) by Ariyananda Bhikkhu (Roderick S. Bucknell). Revised edition with help from Evolution/Liberation. Dhamma Study and Practice Group, Nonthaburi, 1988. 85 p.
Translated from the Thai (ธรรมะกับนักศึกษา) by Ariyananda Bhikkhu (Roderick S. Bucknell). Revised edition with help from Evolution/Liberation. Suan Mokkhabalarama, Chaiya, 1988. 85 p.
Translated from the Thai (ธรรมะกับนักศึกษา) by Ariyananda Bhikkhu (Roderick S. Bucknell). Revised edition with help from Evolution/Liberation. 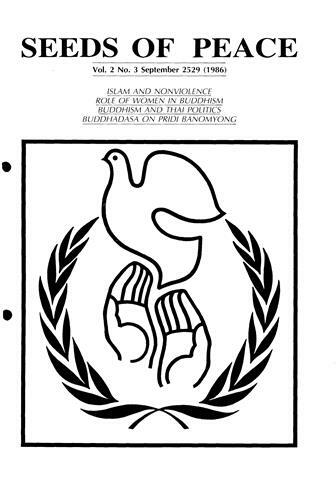 The Buddhadāsa Foundation, Nontaburi, 1988. 85 p.
"Dhamma is Duty, Duty is Dhamma" by Buddhadāsa Bhikkhu. From the video documentary Life and Work of Buddhadāsa Bhikkhu. Translated from the Thai by Santikaro Bhikkhu. In: Evolution/Liberation #3, Asalaha Puja Season 1988, pp. 51-54. Chaiya, 1988. "The Dawning of Truths Difficult For Anyone To Believe (Part II)" by Ajahn Buddhadāsa. Sixth 'Dawning' from Ajahn Buddhadāsa's Eighty Years of Age Remembrance Book. Translated from the Thai by Santikaro Bhikkhu. In: Evolution/Liberation #3, Asalaha Puja Season 1988, pp. 46-49. Chaiya, 1988. "Why Vipassanā?" by Ajahn Buddhadāsa. Translated from the Thai by Santikaro Bhikkhu. In: Evolution/Liberation #3, Asalaha Puja Season 1988, pp. 6-21. Chaiya, 1988. "The threefold training" by Buddhadasa Bhikkhu. From a discourse given by Acharn Buddhadasa Bhikkhu of Wat Suan Moke [being chapter 5 of Handbook for mankind]. Translated from the Thai by Ariyananda Bhikkhu. In J. Kornfield: A brief guide to Buddhist meditation centres in Thailand, pp. 73-79. National Identity Board, Bangkok, 1988. Résumé of a series of lectures delivered to prospective judges in May 1956. Translated from the Thai (คู่มือมนุษย์) by Ariyananda Bhikkhu (Roderick Bucknell). 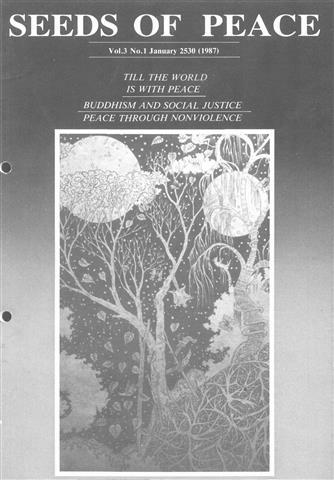 Buddhadasa Foundation, n.p., 1989. 140 p.
Translated from the Thai (คู่มือมนุษย์) by Ariyananda Bhikkhu (Roderick Bucknell). Mr. Chaikri Srifuengfung, n.p., 1989. 140 p.
Translated from the Thai (คู่มือมนุษย์) by Ariyananda Bhikkhu (Roderick S. Bucknell). New edition with help of Evolution/Liberation. Dhamma Study and Practice Group, Nonthaburi, 1989. 126 p.
Translated from the Thai (คู่มือมนุษย์) by Ariyananda Bhikkhu (Roderick S. Bucknell). New edition with help of Evolution/Liberation. Dhamma Study and Practice Group, Bangkok, 1989. 126 p.
Edited and with a foreword by Santikaro Bhikkhu. Dhamma Study and Practice Group, Bangkok, 1989. 159 p.
Translated from the Thai (ไม่มีศาสนา) by Bhikkhu Punno. Mental Health Publishing, Bangkok, 1989. 47 p.